I was so excited by last night’s autumn leaf broth that I needed to taste more – thank goodness I’d not used all the leaves in the first experiment! Even better, just a few pages on in the same book was another recipe with leaves at its heart: ‘Vegetables cooked with autumn leaves’ (p 194). 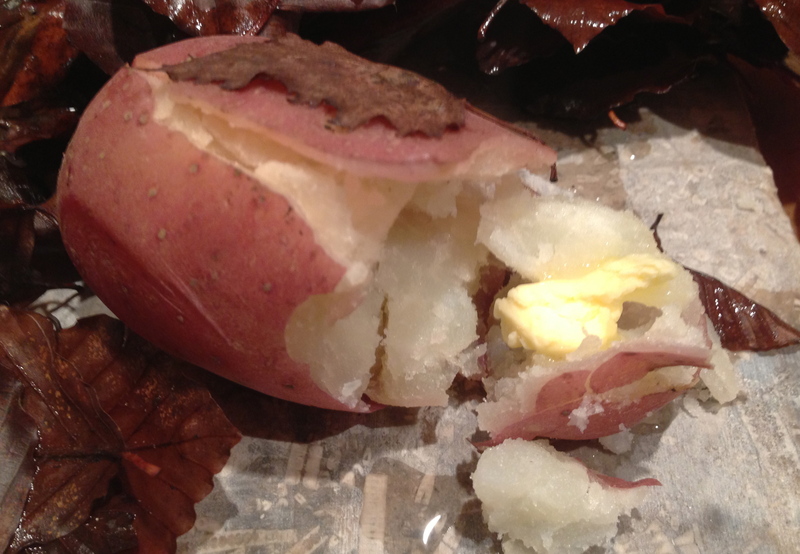 The idea behind the recipe is to evoke all the experiences and sensations associated with digging up and immediately preparing and eating a new potato. Although it all began with a potato, the technique also applies to other root vegetables. 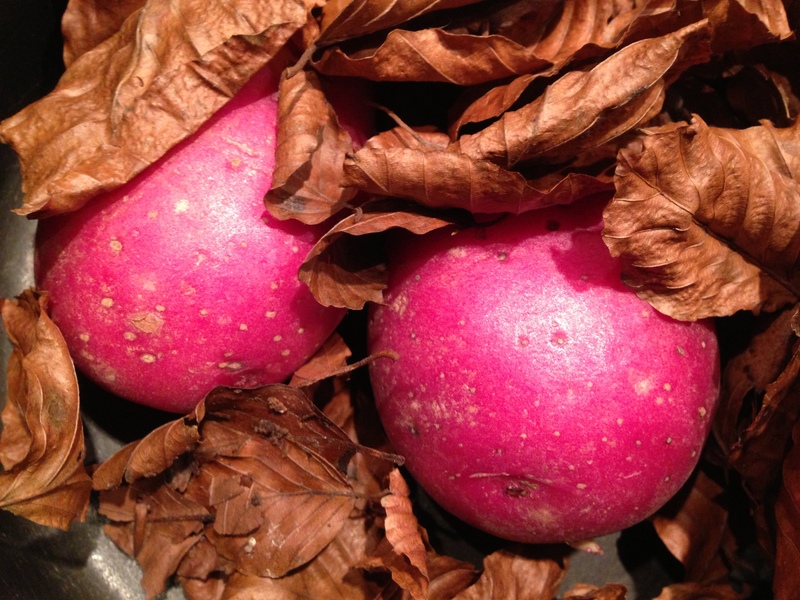 Having tried it, I’m sure it is wonderful with other roots – but all I had was a medium sized red-skinned potato, organic but beginning to get a little bit tired, having hung on valiantly since an Abel & Cole Christmas delivery several weeks ago. So there it was: some old leaves and a tired potato. But I was encouraged by the success of the broth of autumn leaves – and what a revelation this was! Even the smell of the simmering leaves was wonderful, earthy and savoury, and the end result was one of the most delicious potatoes I’ve ever eaten. Cooking with the leaves really had given this ordinary tuber all the flavour of one of its its youngest, newest, freshest cousins – and then some. The presentation, hiding the potato under the leaves for the diner to discover, is truly captivating (even if you’ve only done it for yourself! ), and eating with your hands always makes everything more immediate and satisfying, somehow. I just loved this dish. Thank goodness for winter and its rich pickings of old root vegetables. I just wish I lived closer to a wood and its deep piles of autumn leaves, my new favourite condiment. from Nilsson, Magnus. Fäviken. London: Phaidon Press Ltd, 2012, p 194. 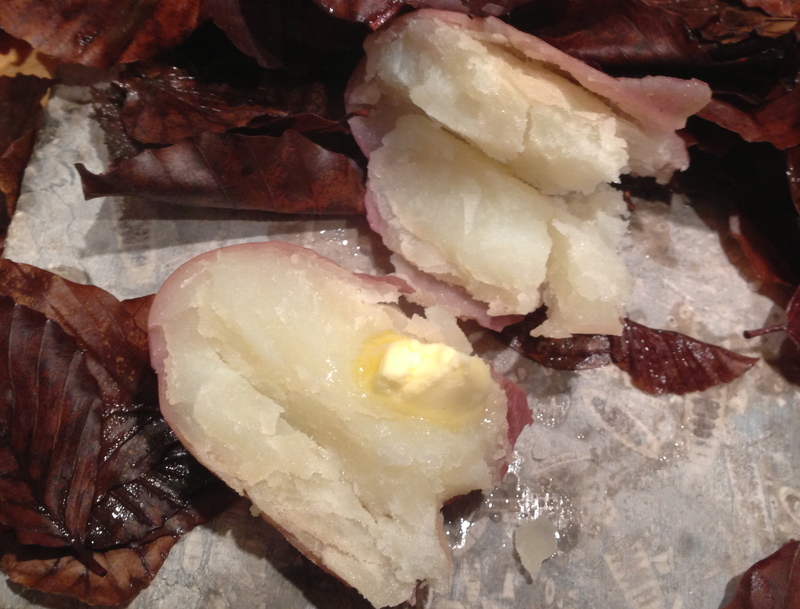 Place the potatoes and leaves in a pot, covering with water and a lid. Bring to a boil and cook until perfectly done – do not over cook. 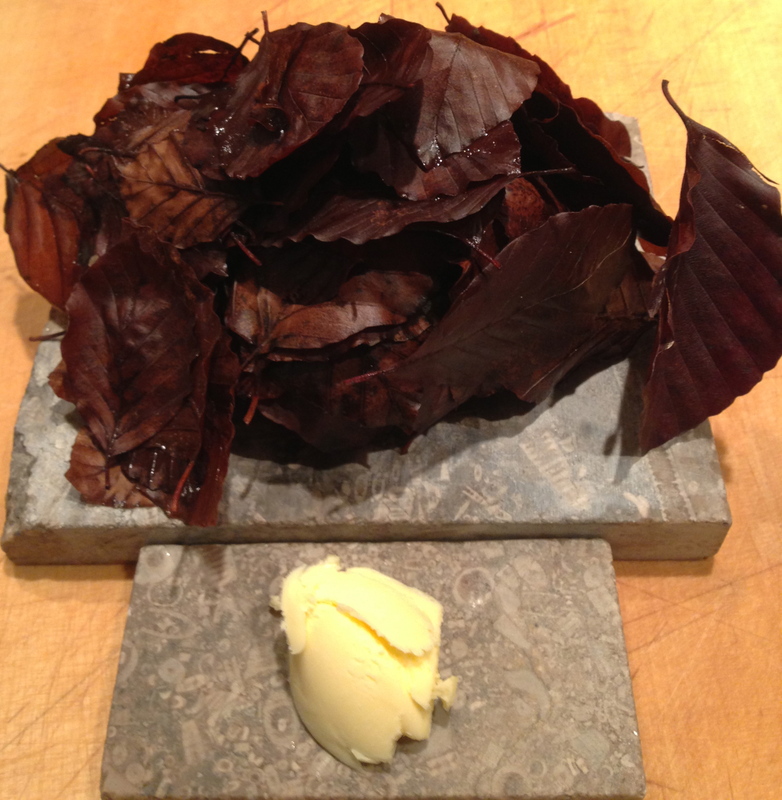 Plate the potatoes on a hot stone and cover them completely with the drained leaves. Serve the best butter you can find on the side, and explain to the diners how to dig out, crush, and eat them with their hands, dipped in the butter.